In Christ, we sing, there is no East or West. In Christ, we sing, there is no North and South. In him and through him, we proclaim, that all persons and souls will meet and find unity. We sing these things, we proclaim these things, and yet our lives witness countless stories of division and discord. In the news are stories of conflicts over land, over race, over political issue, over class, over gender. We have made enemies out of our friends, our neighbors, our family. It often seems easier to maintain the boundaries than to cultivate true reconciliation and healing. Indeed, reconciliation and healing are hard work. May we be instruments, though, of your grace and love and justice, and by turns work to reconcile and to heal – ourselves, our church, our community, our world. One of the great mysteries of our faith, God, is the promise that you bring unity out of diversity. How can this be? How can we find unity, how can we find your same image amidst so many colors, languages, opinions, lifestyles? It is a great mystery that you create us so uniquely, and yet in you we find our unity – a great mystery and a great challenge. Strengthen us not to put difference ahead of love of you and love of neighbor. As we gather around your table today, may we find unity with our brothers and our sisters who also gather around tables like this – or maybe quite different from this. Maybe their tables are smaller, maybe they are more ornate. Maybe others’ tables are set to feed hundreds, or thousands; maybe others’ tables are set to feed but a few. All of us gather to share a meal with the risen Christ. 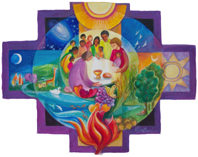 Enlarge our vision today that we see your face not only around this – our – table, but around tables in other sanctuaries, speaking other languages, serving other faces. In this meal we acknowledge that, though we be many, we proclaim on Lord, one baptism and one resurrection. May this be the unity we seek and find, this day and all days.